AT Racing put in a very strong performance today during the 4 Hours of Estoril, the final round of the 2016 European Le Mans Series. Building on the second row position earned by Alessando Pier Guidi during Saturday’s Qualifying session, Alexander Talkanitsa jr., driving the team’s Ferrari 458 LMGTE, slotted into a comfortable second place right from the start. After a contact with a LMP3 prototype precious time was lost changing the right-rear tire and this stop moved the #56 to the rear of the LMGTE field. After a stunning stint by Talkanitsa sr. and lucky safety car phase during his son’s stint, the AT Racing Ferrari move it’s way to second behind the leading Aston Martin with less then an hour to go. 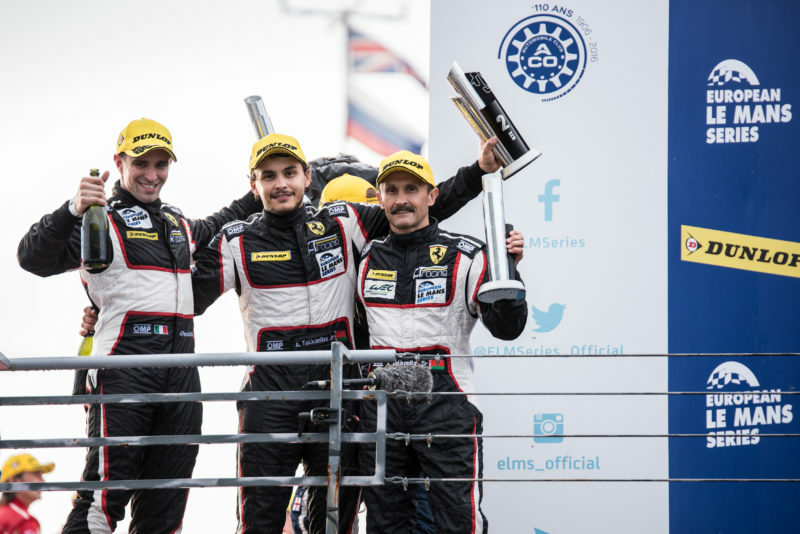 Alessandro Pier Guidi got his head down chasing his target but the Aston Martin was too strong leaving the team to finish in second and claiming the third in the LMGTE championship.